I never ate cabbage growing up. Maybe it’s because cabbage in a consummate winter vegetable, and we lived in places where the growing seasons were long and winter was more of a blip than a season. My first real introduction to cabbage happened in my first few hours as an exchange student in Germany. I had barely slept in the previous 36 hours, and as a result was queasy and didn’t feel much like eating. My host family had made a fancy lunch, complete with generous helpings of sauerkraut. I nibbled at it politely, but for the rest of my time in Germany and several years beyond, I associated the taste with travel sickness and avoided it at all costs. At some point in my adulthood, I got over my fear and decided to try sauerkraut again. I was at a picnic and everyone was eating it on the bratwursts and veggie dogs, so I gave it a whirl. And I absolutely loved it: tangy and salty, with the slightest hint of mellow sweetness. I started making my own sauerkraut after that. I especially like it in grilled sandwiches with Swiss cheese and fried tempeh, but it’s also great for giving a little zing to soups and cooked vegetables, or on its own as a post-exercise snack. Fresh sauerkraut is much better than the canned stuff: it’s crunchier and has a cleaner flavor. 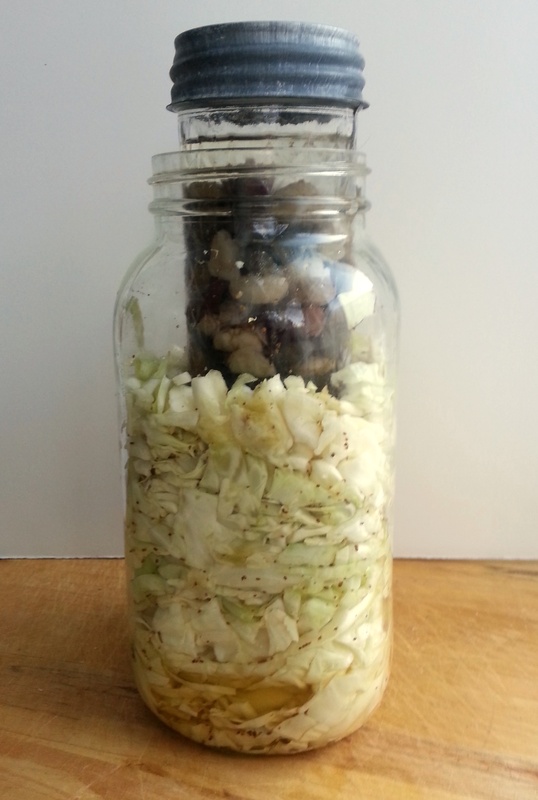 Plus, the good bacteria that ferment the cabbage into sauerkraut are alive in the fresh stuff. They are lactobacilli, related to the bacteria in yogurt and just as good for your digestive system. I was recently on antibiotics, so right now I need all the lactobacilli I can get. Earlier this week I picked up a 5-pound head of cabbage at the co-op, and today I used 2 pounds of it to start a new jar of sauerkraut. It was remarkably simple. 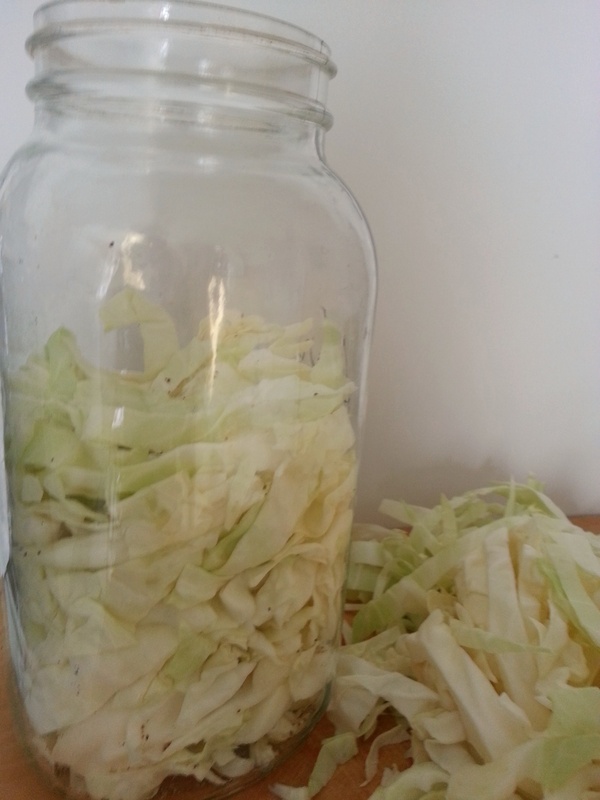 Unlike with yogurt, you don’t need to obtain a bacterial culture to make sauerkraut. The lactobacilli on the leaves and in your kitchen (yup, they’re everywhere) are enough to get the ferment going. Adding salt discourages the growth of undesirable bacteria and yeasts. Adding certain ground seeds – celery, caraway and dill – or seaweed can also keep bad microorganisms from taking over, according to Wild Fermentation: The Flavor, Nutrition, and Craft of Live-Culture FoodsReclaiming Domesticity from a Consumer Culture by Sandor Katz, but they’re not as effective as salt. First, I shredded the cabbage. 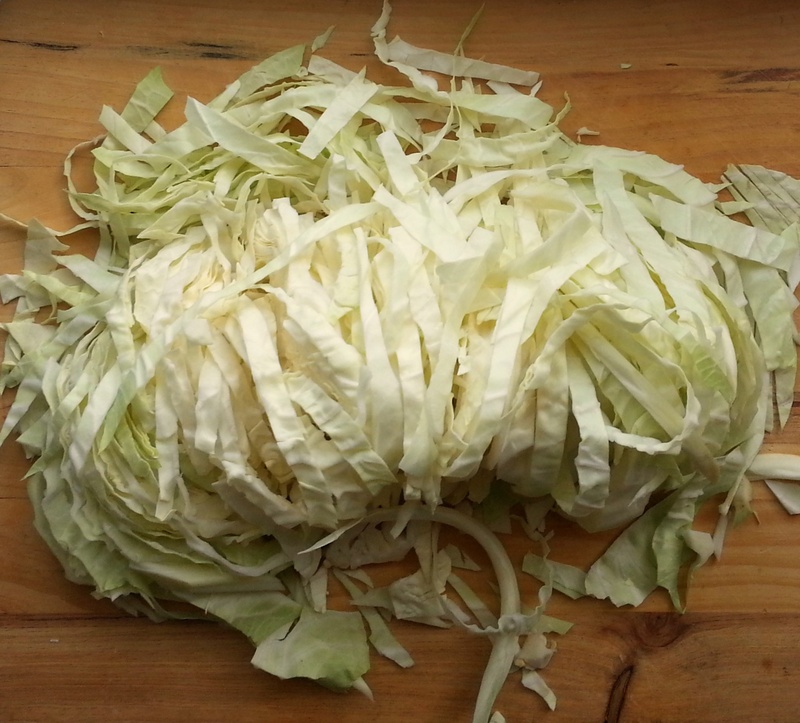 I set the halved cabbage flat side down and cut it into thin, longitudinal strips. You can use a vegetable grater if you want really thin pieces of cabbage, or chop more roughly if you want bigger pieces. some people just pull the cabbage apart leaf by leaf, then ferment the leaves whole. 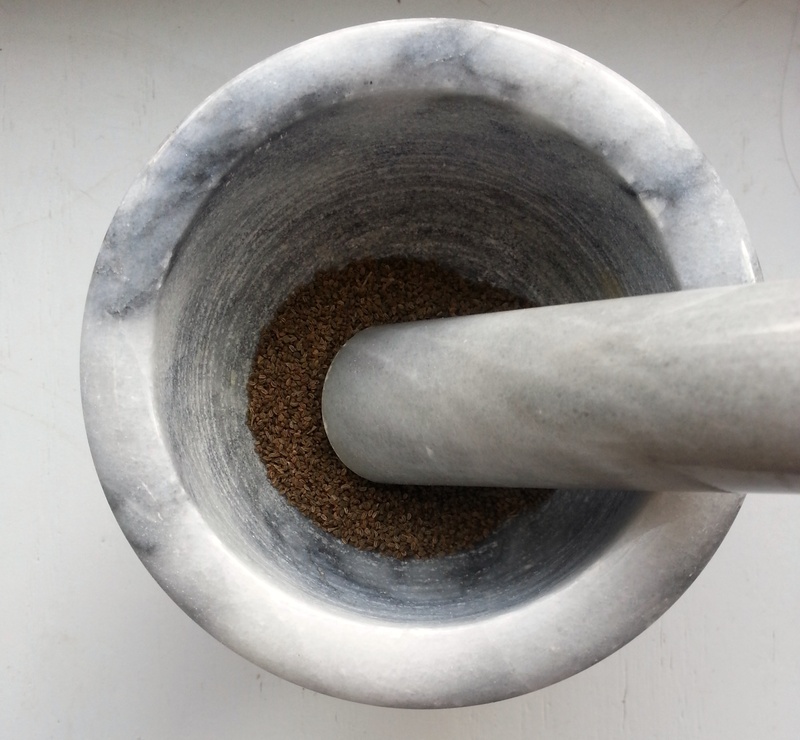 Then I poured the celery seeds into a mortar. 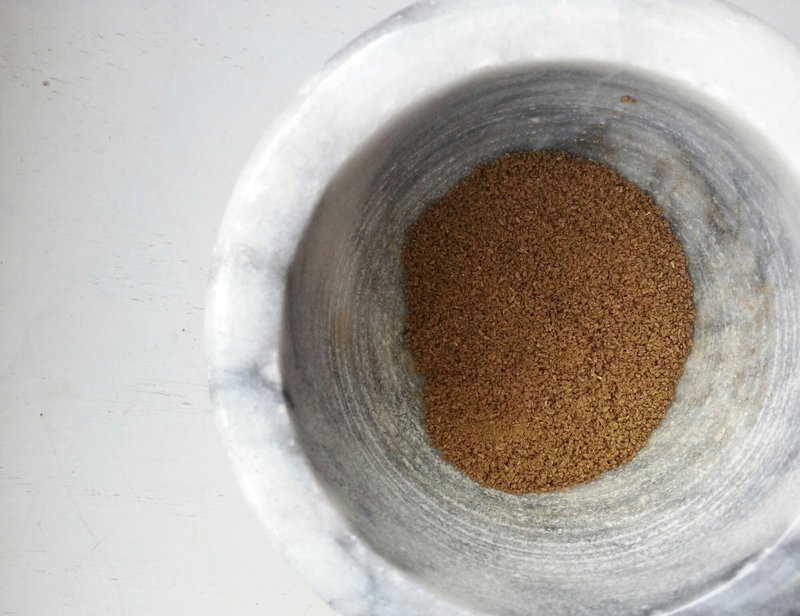 I pounded them with the pestle for a couple minutes. 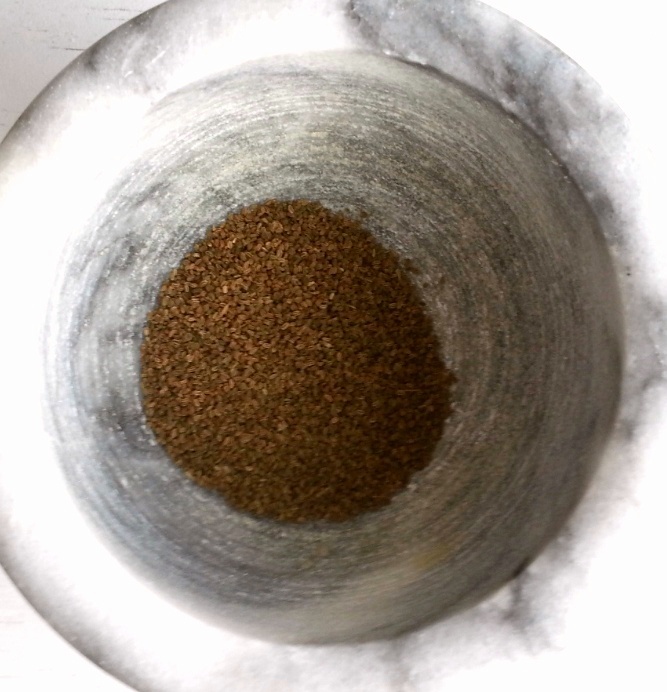 The celery seeds were a little more powdery then they were when I started. 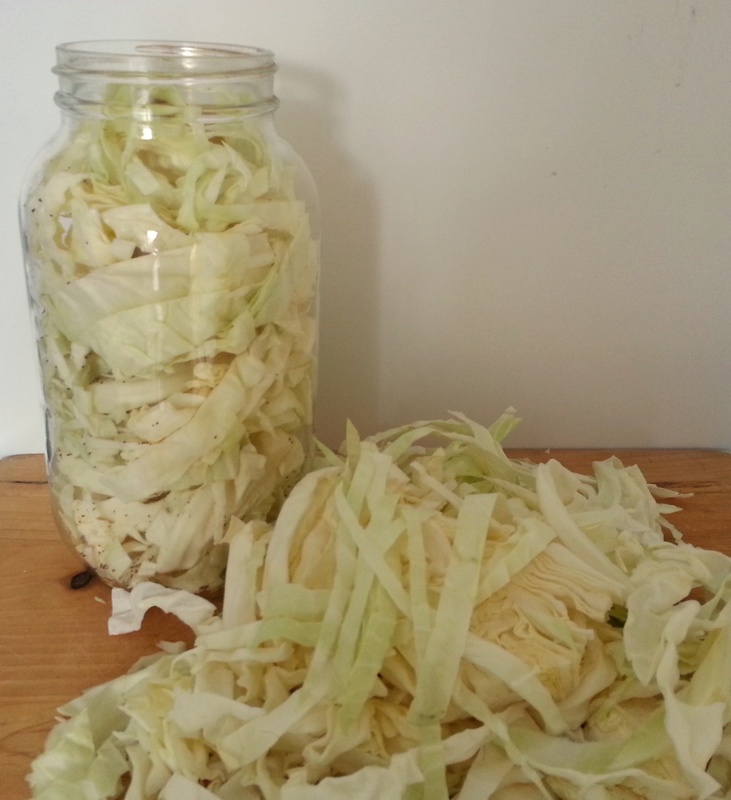 I put handfuls of the shredded cabbage into a 2 quart mason jar, sprinkling on a bit of salt and a bit of ground celery seed after each handful. When the jar was full, I pounded the cabbage down with my fist. 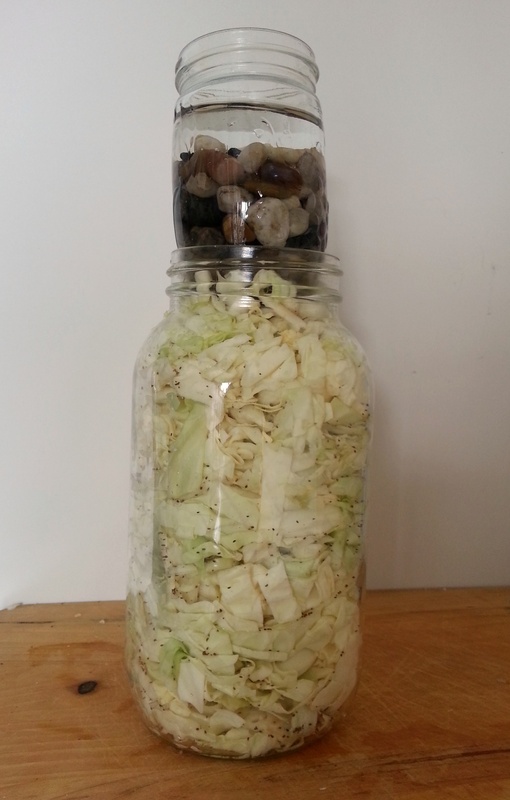 I repeated this process several times until I’d crammed all of the cabbage into the jar and the celery seed and salt were all used up. 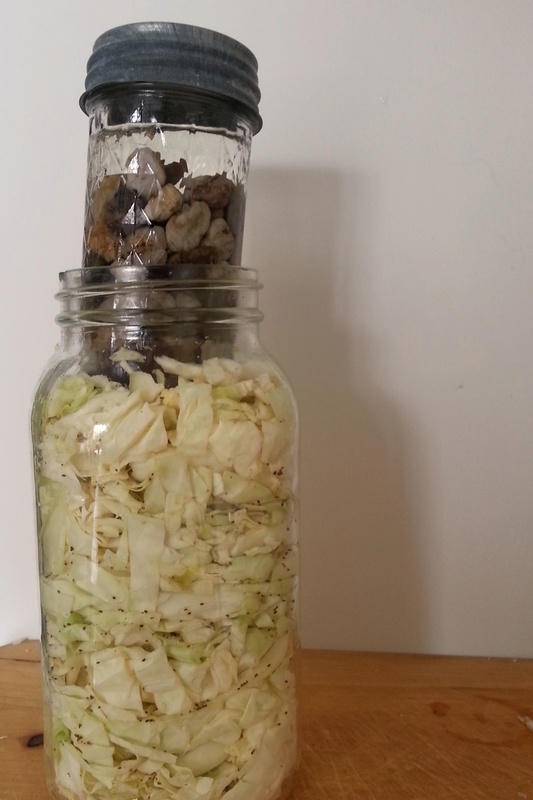 Then I put a jar filled with rocks and water on the top of the cabbage to weigh it down. I switched smaller jars when I realized that the one I chose was too big at its widest point to fit through the mouth of the larger jar. I pressed the kraut down some more. This time, I used the small jar rather than my fist. My job for the next 24 hours is to pound at the cabbage a little every time I walk by it. The salt draws out some of the water from the cabbage, and pounding the cabbage draws additional water out. This creates the brine in which the cabbage will ferment. It looks like you have a great start. My mom makes homemade sauerkraut. I would too, but Hubster and Pumpkin aren't fans. Maybe, but I'm not the beet fan! Haha. That's an awesome lab assignment! Yes, it was Applied Bacteriology and it was by far one of the greatest classes I have ever taken. We made Wine and Cheese as well. That sounds awesome! I need to sign up for that class. ​Great tutorial. I love sauerkraut and beets too by the way. So how long does it take for the sauerkraut to ferment and be ready to eat? Or should we stay tuned for part II :). I've made homemade yogurt and pickled vegetables many times in the past but never thought about making sauerkraut. The length of time you need to ferment it depends on the temperature in your house. This time of year, I expect it would start being ready in about a week, but could be kept at room temperature for several more weeks to develop flavor without the cabbage getting too mushy. In the summer, it would need to be moved to refrigeration sooner. I *do* plan to post more details next week. Great post - I'm going to be following your steps on Friday when I make my first batch! Enjoy! I should have an update on this batch by then.